The state of Illinois currently has over 150 colleges offering online programs. Illinois is home to many large corporations and key institutions that have hired from many student programs within the state. Online colleges in Illinois are a great choice for individuals looking to advance in their career. Online programs have many benefits for the average working student. Flexibility and convenience are attractive factors that make online learning so desirable. Learning online promotes self-discipline, time management, and ability to learn independently which are valuable skills to have in the work field. Below, the top online colleges in Illinois are curated based on academic quality, the variety of programs, student resources and more. Many schools emphasize different values, it is important to find a college that best fits your career and educational goals. Governors State University is founded on the principles of innovation, openness, and flexibility. Online courses are delivered in a 15-week long format. Degrees and certificates can be achieved through GSU’s online learning programs. GSU encourages all of its students to engage with the division of student affairs, which helps students throughout their program. National Louis University’s online programs have developed into one of the leading institutions for distance learning. NLU provides each online student a one to one industry-related mentor that students can gain insight from throughout their program. While many degree options vary, many can be completed in as little as 18 months. The university offers 18 degrees in undergraduate, graduate, and postgraduate levels. While most online degree options require some outside engagement, NLU allows students to complete requirements wherever they currently reside. Its most popular degrees to be completed are business management and business administration. Lincoln Christian University has roughly 20% of its student body enrolled in online programs. LCU offers 7 degrees options at undergraduate and graduate levels. A mandatory online introductory course must be completed to help students get familiar with the online portal. As a religious institution, Christian values are incorporated into the curriculum emphasizing principles related to education and leadership. LCU maintains affordable tuition and has financial aid options as well. Aurora University is a small school that offers quality education to its dedicated students. Online students still have the same opportunities as on-campus students such as gaining a hands-on internship and networking with award-winning faculty. As a convenience to students courses are offered year round in five to eight-week formats. Student interaction is made through online discussion boards, chat rooms, and more. Social work, criminal justice, computer science and other degrees are available to students online. Greenville College promotes a collaborative learning environment within its online portal. In each program study groups, group assignments, and more provide students with access to peer help and allows individuals to gain insight from others in the same courses. Greenville also has designed an academic boot camp and coaching program for students who feel they need extra help while earning their degree. Some of the online programs can be completed in as little as 20 months with accelerated bachelor’s programs. Greenville’s most popular programs are business administration and master of arts in teaching, curriculum, and instruction. Western Illinois University’s School of Distance Learning offers flexible degree completion programs. Nursing, business, and education are WIU’s top three sought-after programs online. The university has grown from 200 to 10,000 students since it was first founded and continues to grow. A unique feature that WIU offers is that students can self-pace and take as long as they need to complete their degree. 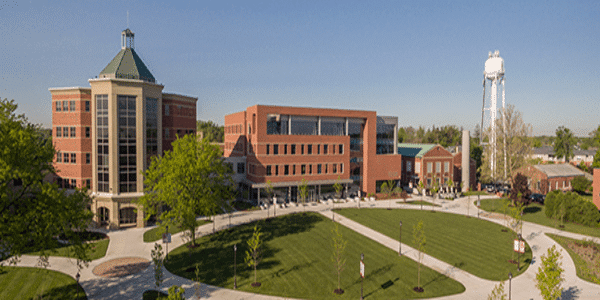 Benedictine University requires an online simulation course to ensure that pursuing an online degree is the right path. BU allows students to transfer up to 90 credits making for a faster degree completion. The university values well-prepared students and help those students become prepared professionals by providing any and all educational experience that can be of use to them. Individualized academic advising, tech support, access to the online library and bookstore, and more are easily available to students seeking guidance or resources. Quincy University is known for its student engagement within its community. Preparing successful leaders for the work field is something that QU does well through its academic programs. Online degrees allow students to take and complete courses at their own pace. Programs require proof of age to ensure that the student is an adult. Quincy encourages students who are self-motivated and who have strong time management skills to enroll in online courses and receive the benefits of digital learning. QU is adamant about its career services and helps students work towards their career goals. McKendree University is one of Illinois’ oldest university with an established online learning portal. Students have access to online orientations to explore different programs before committing and enrolling. Nursing, education, and business administration are McKendree’s top online programs that students enroll in. Part-time and full-time options are available as well as accelerated formats to shorten time earning a degree. Academic, career and financial services can be easily navigated on the university’s home page to maximize student success. Judson University, a Christian Institution, has one of the leading online programs in the state of Illinois. With 5 bachelor’s degrees to choose from, Judson assists its students through its online career center, focusing on students’ futures. There are no differences between online degrees and on-campus degrees, students receive the same recognition. Judson has a student to faculty ratio of 10:1, and values the student-teacher relationships from its small class size. Students also receive access to financial aid and scholarships as well as assistance in finding an internship to gain experience from. Concordia University’s learners enter a dynamic and exciting environment when enrolling within the online programs. The courses are structured to allow students to access and complete assignments at a time that best fits their needs. Online students are permitted to take only one class per semester to ensure students dedicate time and focus to complete the course. CUC’s online community is 40% of its student body, which has led to developing and providing top resources to its online learners. The University of St. Francis is one of Illinois’ largest online community. There are many platforms that are used in the university’s online system to increase engagement among peers and teachers such a video chats, discussion boards, etc. All courses are taught in 8-week accelerated formats specifically designed for working adults. USF integrates service learning and ministry to promote transformational experiences among its students. St. Francis shapes its students to becoming leaders and applying theories to real life practices. Olivet Nazarene University has designed its online programs to be accelerated for students to finish in less than 2 years. ONU offers bachelor’s and master’s level degrees in topics ranging from engineering to criminal justice. The University understands that its online community has other commitments and that convenience and flexibility are key components to making an online program beneficial. Each year Olivet adds new programs due to its growing online community. Students are drawn to the environment that the school has created both on and offline. Dominican University has small and personal online classes, that are supportive and interactive with peers and professors. DU offers 3 online programs to choose from that are in high demand and hold a high standard for online education. Dominican University is constantly improving its online academics to provide the same type of learning on and offline. The 3 programs include bachelor of arts in human services, bachelor of arts in legal studies, and master of arts in conflict resolution. Elmhurst College makes earning a degree for busy adults that much easier. Bachelor’s degrees and certificates are delivered in four or eight-week formats that can be accessed on the student’s schedule. Elmhurst also offers an online MBA program, with the option to specialize in an area of interest. Elmhurst also has a generous transfer credit policy to help students remain on the right track to earning a degree with little to no setbacks. Information technology and applied psychology are two well-known programs among many that the college offers. DePaul University provides students with a wide range of study options accessible from their home. DePaul offers 6 bachelor’s degrees and 20 master’s degrees achievable in an online format. The university is one of the largest Catholic Universities in the United States, with many organizations and networking opportunities to benefit from. DePaul has invested in its distance learning programs, which has resulted in the unique curriculum that students are drawn to. The University believes in accessible education and has provided the means and tools for students to be able to access and learn from any location. Top online programs from the institution include computer science and business administration. Loyola University Chicago offers an assortment of degrees at all academic levels. Its online programs belong to 3 different categories; online, hybrid, and blended. An abundance of resources is available to students such as online tutoring, library, career development, and more. The University is especially known for its degrees in law, nursing, and psychology. Its trained faculty creates and delivers the material for online students and provides support within the online realm of learning. Loyola maintains its 14:1 student to faculty ratio to maintain the quality relationships that students can have with their instructor. The ranking process was determined by tuition cost. Beginning with the lowest amount the list progresses. If you know of a school not listed here, but that deserves consideration for a future revision, please contact us today!